This Stoneleigh Country Club Blush Summer Wedding was one for the books! I loved everything about Ellen and Ryan’s wedding. Weddings are so much more special when the couple makes the feel of their wedding whatever they want it to be and don’t worry about what’s “normal.” Ellen and Ryan did just that! I’ve never photographed a wedding where the getting ready location, ceremony, cocktail hour, dinner, and reception were all at different locations. Stoneleigh Country Club has the cocktail location, dinner, and reception all close to one another but it was really neat walking to different locations throughout the venue for various events. This wedding was also a first for my second shooter in that she got locked in the bathroom at the church! Legit stuck inside the bathroom since the lock had jammed from the outside of the door! She called out and the groomsmen and one of the church ladies were able to get her out. What a story, haha. At the beginning of the ceremony, the mother’s both lite a candle. The one candle didn’t want to stay up and fell over a few times. During the ceremony when it fell again, the priest handed it to Ellen’s sister and she held it for the remaining of the ceremony. It was so pretty! This wedding felt like a cooler September day even though it was the beginning of July and we had been having 90+ degree days all that week! The weather was absolutely incredible which made portrait time super fun and enjoyable. The bridal party even had particular portraits in mind. The guys wanted to do a cigar photo and the girls wanted to spray champagne! 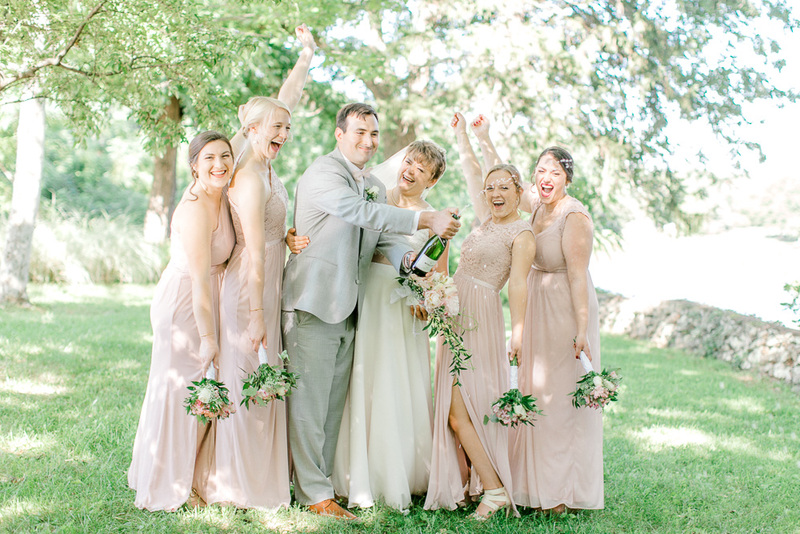 How fun is this bridal party!? Towards golden hour, Ryan had a “money shot” as he called it in mind. He wanted to go to the top of the hill and have a photo with the gorgeous view in the background. We took golf carts up the hill, yes I drove that thing, haha, and we got golden hour portraits on the hill with the awesome views! Ellen and Ryan ended the night with first dances and enjoyed their evening with bread pudding and snack bar with personalized M&M’s! There were so many sweet details throughout the wedding. Did I mention Ellen’s mom made her veil and the floral clips that she and her bridesmaids had in their hair? Ellen’s sister made all the gorgeous signs located throughout the wedding!! Such a talented family! Thank your Ellen and Ryan for choosing me to capture your wedding day. I am so grateful to have met you both and absolutely loved working with you both!! Enjoy a few of my favorites from Ellen and Ryan’s beautiful summer Stoneleigh Country Club wedding. Special thank you to all vendors who made Ellen and Ryan’s wedding so special. To see Ellen and Ryan’s engagement session, click here. To see more recent weddings, click here. Sarah Botta is a Northern Virginia based wedding photographer whose work can be described as organic, natural, and timeless. Sarah specializes in capturing people’s stories and building connections with each client to help tell their story.